LSBU and Transport for London (TfL) have been working together on the apprenticeship scheme for four years now, and the relationship continues to grow and develop. Brendan Robinson thinks it's time more businesses got involved with apprenticeships as the advantages are clear to see. 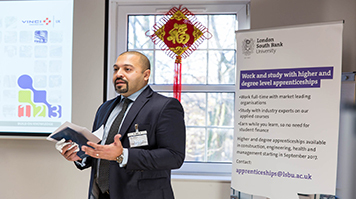 Why do you send your apprentices to LSBU? BR: We’ve been working with LSBU for a number of years now, and in the last couple of years, we have used LSBU for our Quantity Surveying apprenticeships. It needs to be a symbiotic relationship with the university because we need the staff here four days a week and we know that works very well with LSBU. The most important consideration for us – and our apprentices – is the fact that the LSBU scheme is RICS-accredited. Our goal is to take all of our team through to Chartered status, which is what makes LSBU such a good match for our ambitions. How do you identify people to send on the scheme? BR: Our search begins with looking for candidates for Level 3 apprenticeships, and we advertise for those interested in taking the apprenticeship route to becoming a Quantity Surveyor. We filter the applicants down through a series of tests before the interview stage and we then employ a number of them, who are considered suitable applicants, on two year fixed-term contracts. Those employees undertake a Level 3 apprenticeship and are expected to pass that and the RICS Associate qualification. Once they have done that, there is usually the opportunity for them to be employed on a permanent basis and we send them to LSBU as part of the deal. We call them Junior Quantity Surveyors at that stage – it’s effectively a five-year apprenticeship, with the final three spent at LSBU. Why do you pay to put peopl through university, instead of hiring graduates? BR: Investing in people is a big part of our business, and so it is not just a case of employing people to do the jobs available. Moreover, there are multiple routes to becoming a quantity surveyor and it is important to recognise that university is not for everyone. By offering apprenticeships, we are enabling people to earn as they learn and they will also have a vast knowledge of TfL and how it works by the end of the scheme. Sometimes for those joining the business without any background knowledge of the organisation, it can take a while to learn the ropes. Apprentices also have the benefit of being involved in our performance and development programme for three years, alongside their apprenticeship, which means that we tend to have employees who fit into the TfL culture even before they qualify. How many staff do you have on the scheme? BR: We’ve increased the number of staff we send on the scheme year on year. We started with three, but are up to five or six a year now – and we have plans to grow that further next year. We have had over 20 apprentices on the scheme, some of who have now graduated. What does TfL get out of the Degree Apprentice scheme? BR: If you engage with the apprentice scheme properly, then there are many benefits – and what might surprise some people is that they extend beyond the apprentices themselves. Of course, you benefit from apprentices being part of your organisation because they see things differently with new perspectives. More than that, though, their enthusiasm and fresh thinking can invigorate the teams that they are part of – people who may have got used to their current routines or ways of doing things can be given new impetus through the introduction of apprentices to their team. If you take on apprentices though, you need to make sure that they are given the right kind of support and mentoring – and that’s another benefit of the scheme. Some people really enjoy nurturing young staff, and the scheme gives them the chance to take on those opportunities, which can often lead to their own confidence levels improving. Additionally, the need for the apprentices to be capable of progressing through the RICS qualification means that managers have to be accountable for their development. This can be beneficial for the apprentices’ managers, particularly if it is their first time managing somebody, as it encourages them to understand and take on the necessary responsibilities. Does coping with losing staff for one day a week cause any issues? BR: Not at all. You know what the situation is when you take an apprentice on, so their day release to university is built into your planning to start with. If anything, it gives the employee extra skills because they learn to manage their workload while studying. Time management is a valuable skill because things can happen in the course of your job that mean you have to plan and manage your workload anyway. We’re also very supportive and flexible so if a student is finding it difficult, we can slow their workload down a little bit to help them get back on track. Similarly, if we have an employee who feels that they are ahead of the game, we can give them extra challenges to push them further – but always at a pace that they feel comfortable with. At the centre of it all is good communication with the apprentice themselves – we have to trust that they are coping well, and make sure that we have systems and processes in place that give them the chance to tell us if there are any problems so that we can help. What do you think the future holds for apprenticeships? BR: They’re a really big part of recruitment now. Employers who don’t yet understand just how much value apprentices can add to an organisation are missing out on a great opportunity. Apprenticeships are one of the best ways to attract and develop your staff, and they are very easy to find out about. Young people are increasingly finding out about apprenticeships and agreeing that they are a reasonable alternative to just studying at university. In order to attract the best people, organisations need to get on board. They need to make sure they are offering effective apprenticeship schemes in conjunction with good universities that are going to deliver what young people are looking for as they start their career.